So-called ‘Better Deal’ sounds like a [Union Boss] wish list. The union-label politicians who head the Democrat Party caucuses in both chambers of Congress are ow publicly staking their 2018 hopes of regaining operational control of the US House and Senate on the forced dues-derived might of the Big Labor political machine. 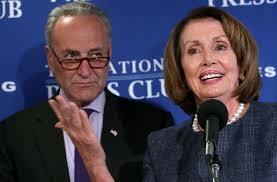 At a November 1 press conference, House Minority Leader Nancy Pelosi 9Calif) and Senate Minority Leader Chuck Schumer (NY) flanked by other top DC Democrats and union powerbrokers like AFL0CIO boss Richard Trumka, unveiled an aggressive package of pro-compulsory unionism legislative proposals. Huffington Post reporter Dave Jamieson acknowledged that the legislative package ‘sounds like a wish list” for Big Labor.